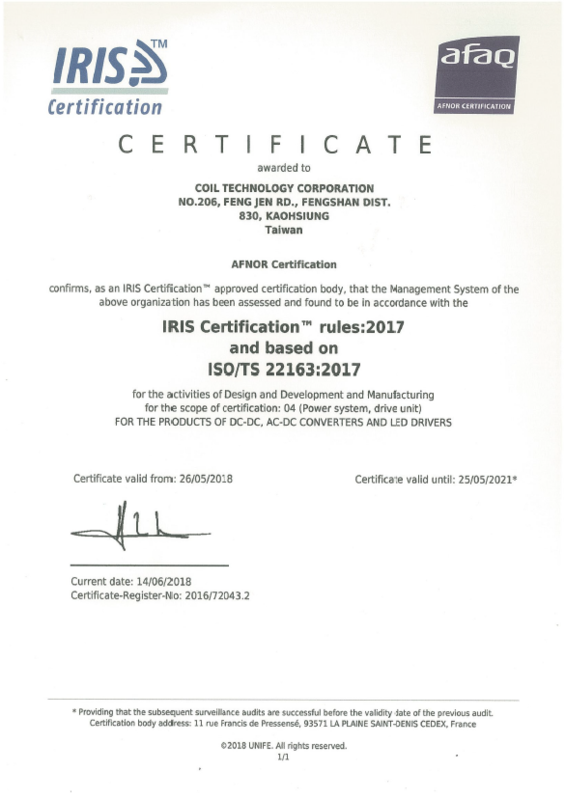 International Railway Standard Certification is upgraded to ISO international standard by May, 2017, IRIS will be substituted with ISO/TS22163, IRIS will be expired on September 14, 2018. After intensive preparation and audit, CTC successfully achieve upgrade and transition, we receive the certification in July. In the future, we will keep providing product and service which are reliable and compliant with ISO/TS 22163 requirement. ISO/TS 22163 is the latest standard of business management, it integrates the essence of all ISO standards. After being certificated by ISO/TS 22163, CTC will be with the management system of latest and complete risk management and adaptive strategy. CTC is the only corporation certificated with ISO-9001, TS-16949, ISO/TS22163 and ESD/ANSI-2020. We can 100% ensure not only the product, but also our workflow and service to match quality management system for every high-end application from the very beginning. From design to manufacturing and technical support, every single detail is operated under highest standard.